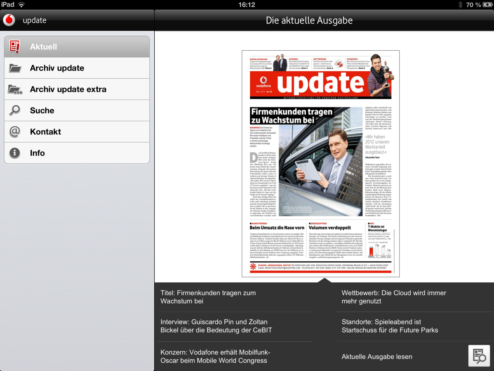 The application ‘Vodafone Update’ supplemented Vodafone Deutschland’s printed employee magazine. Employees of Vodafone and everyone who is interested in the magazine are able to read it on a tablet PC. 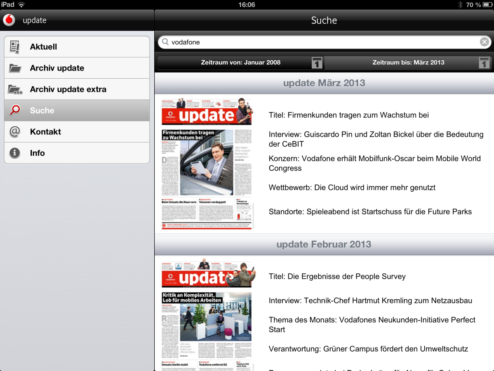 The application ‘Vodafone Update’ supplemented Vodafone Deutschland’s printed employee magazine. Employees of Vodafone and everyone who is interested in the magazine are able to read it on a tablet PC. You can zoom into infographics and websites are directly linked, making it easy to get all the information you are interested in. Another function is the archive, where you can find all the published issues and a search function. With the feedback form, readers can get directly in touch with the editorial department.